Hey guys, I made a little birdy themed notecard set using some collage sheets and fun little glassine envelopes. They look like tags, but they actually are folded pieces of paper, so you can pull them out and write a little note inside. And I do mean little. They're smaller than 2x3''... So hopefully, you don't have a long-winded sentiment to express. Speaking of long-winded sentiments: Blllerrrrrgh, world. Blergh. I think I need a fast forward button for the next few weeks or so. Bobby and I are finally getting things rolling with an IVF cycle. Well, we WERE, but they did another tests and surprise, I need another surgery before we can continue. So, a delay. I'm scheduled for surgery on Valentine's Day. Funny story: during the diagnostic ultrasound last week, the nurse pointed out that my uterus is the shape of a heart, I saw it on the screen and was like, "Oh it is, that's pretty cute." Turns out, not so cute. I have a fibroid tumor pushing the top of my womb to make it heart-shaped instead of nice and round on top. Yay. And there are others, and polyps (all benign) but they all need to be removed. I feel super shizzy (if I cussed, I would have cussed there.) I'm on medicines that are making me crazy, and frankly, I do not feel nice. I hate not being my usual cheery-colorful-yet-awkward self. I am a blob today. My apologies for the moping... but I need to get it out someplace. I just realized that I hadn't posted these yet! Lucky for me, it's still January, so they'll still be somewhat appropriate :) I made some New Year/Doorways themed ATCs using some Alpha Stamps Collage Sheets. The doorways theme came about because of the ancient Roman god, Janus, who was the god of new beginnings, gates, and doors! And the Romans named January in honor of Janus. Fun fact! 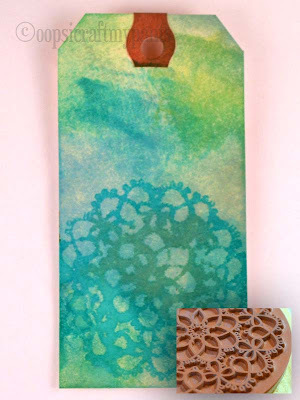 The base is a 1x1" wooden block that I decorated with some really simple stamped inchies. A photo of the plain wood after carving, before sanding and painting! Hey homies, it's playtime! I love playing with colors, you all know that. 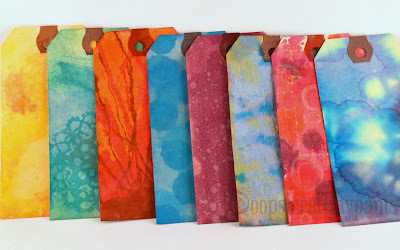 It should come as no surprise that I've been spending a lot of time with these Tim Holtz Distress Stains (You can find them at Alpha Stamps!)... The new winter colors are so flippin' awesome. Most of them are actually really bright, not what you think of when the winter chill of January rolls around. 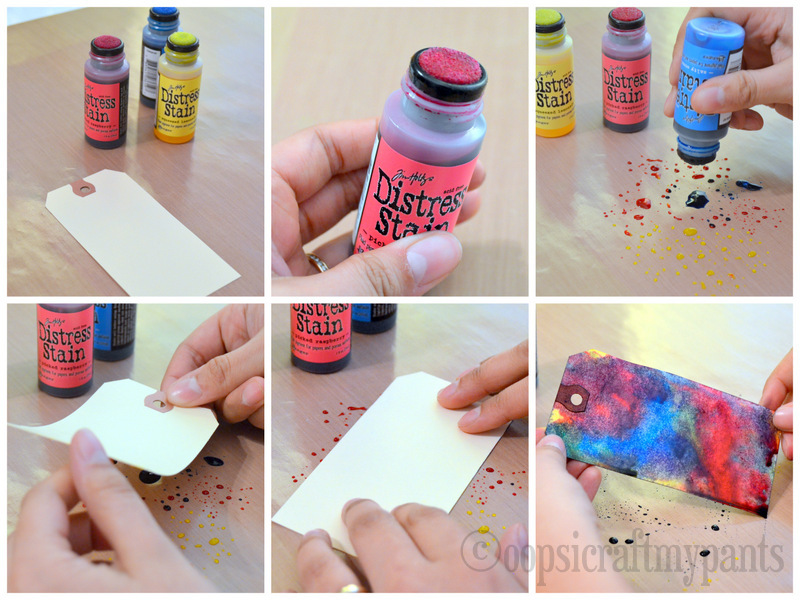 So here's a tutorial on how to use Distress Stains to make eight different totally awesome backgrounds on manila tags. Let your base dry off a little bit, enough to where the stain has soaked into the tag and there are no more runny spots, but the tag is still damp. Simply use the dauber end to make little polkadots. 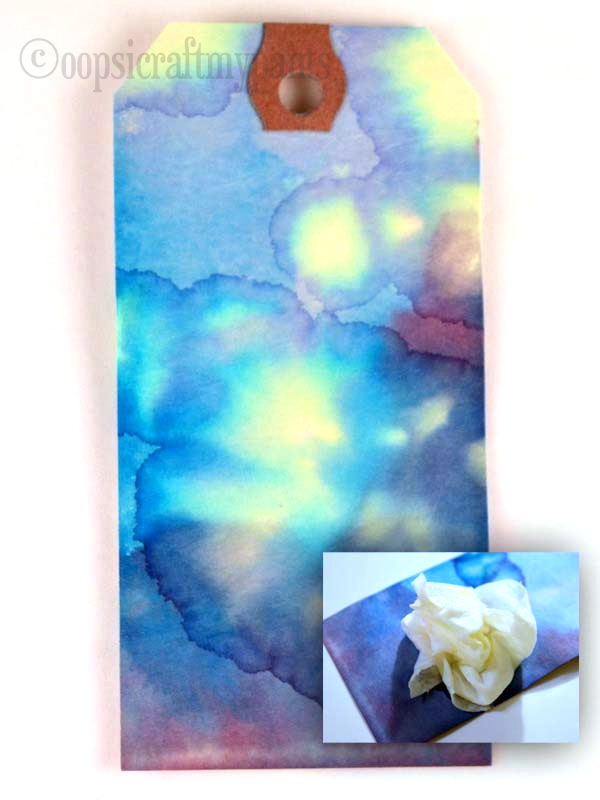 The stain will blend in places and stay crisp in other places, so it looks pretty cool. Using water with Distress Stains is a super-easy way to create a subtle effect. 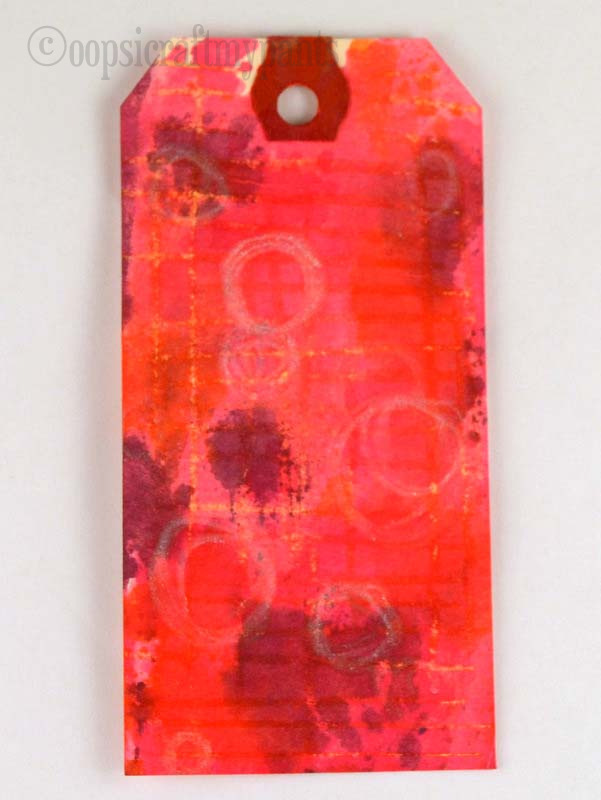 For this tag's base, I just used the dauber end like a marker to color the entire tag, let dry for about 15 minutes, then spritz plain old water on it with a spray bottle. Easy McPeasy. This is my favorite effect, and I came across it completely by accident... I had a baby wipe out on my table to clean up a rubber stamp and it got bumped onto one of my stained papers. It kind of sucked up/spread out the colors to make a really cool tie-dye look. 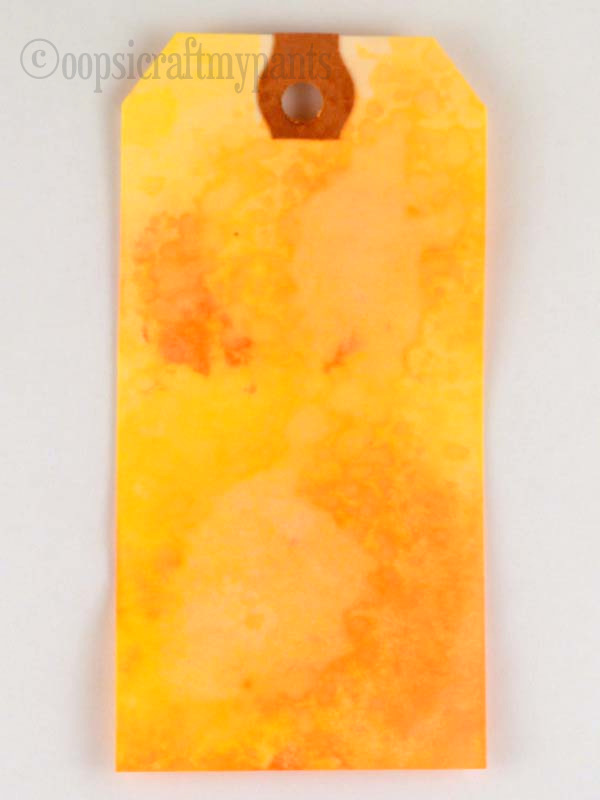 To get this effect, loosely wad up a baby wipe and just gently set it down on your tag so there is contact in several places. Wait 15-20 minutes, pick up the baby wipe, and voila! Have you got a can of compressed air hiding around somewhere that you bought to clean your keyboard? You can use it with your Distress Stains! 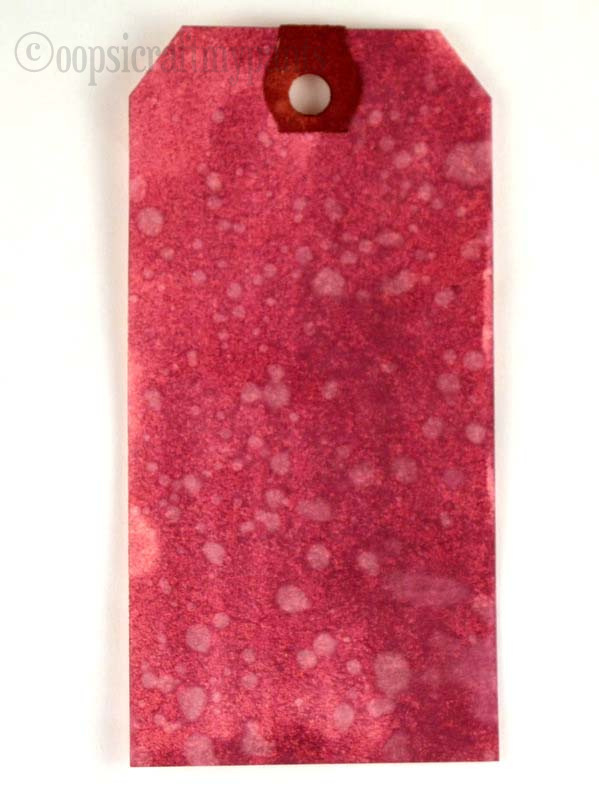 Just dab/squeeze a few drops of stain at the bottom of your completely dry stained tag and use the canned air to spray the droplets to the top. Let that layer dry completely, and do it again with a different color. It's important to wait for things to dry with this method, because if the paper is wet, you'll lose the detail of the branches. These Distress Stains are water-based, so if you use crayon on your tag before staining, those areas will resist the stains a little and add some interesting texture. 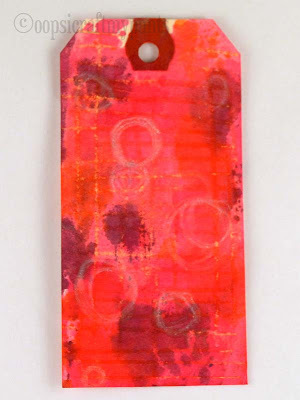 For this tag, I drew lines with a yellow crayon and circles with a white crayon before dipping my tag in stain. To get this look, squish your tag while it's still pretty darn wet together from top to bottom to get a nice even crumpling. While the paper is still crumpled up, dab the ridges with a couple of different colors. Leave it alone for maybe 5 minutes, and then smooth out the tag to let it dry. Once it's completely dry, you can place it between a couple of sheets of paper and use your iron on low to flatten it out a little more. I really like this method, it was kind of hard to photograph, but in person, the effect is really pretty cool. It reminds me of travertine tile. Classy. Just spray your plain tag (before putting any stain on) with a little bit of veggie oil, let it soak in for a few minutes, then dip your tag in stains. As is the case in LOTS of crafts, stamping makes the possibilities with this technique endless. Let your base dry for maybe 10-15 minutes, enough to where the stain is beginning to dry in areas, but the tag is generally still kind of soft with moisture. 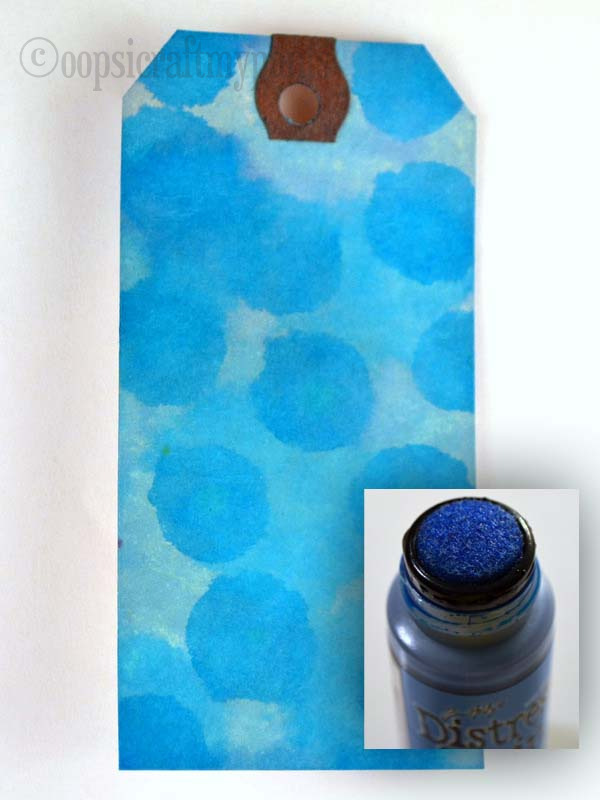 Dab some stain directly onto your rubber stamp with the dauber and stamp your tag! I like to use patterned stamps or designy-type ones that will make a good background. So there you have it! Pretty soon you'll have tons of pretty little tags that are just waiting to be embellished. 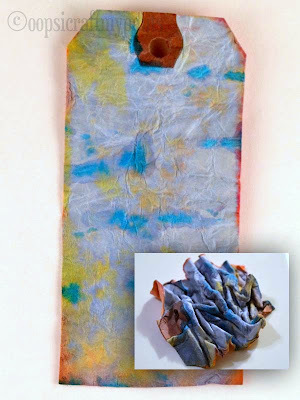 Go get some Distress Stains and make a mess, experiment some new techniques, and have some fun. I told you they were coming... More felted birds!!! I made this set for my tiny Filipino mom who absolutely spoiled me with all sorts of huge colorful earrings and goodies this Christmas. They're ornaments, but I took photos before I added the string loops for hanging. This yellow one was Bobby's favorite because of all the crazy colors. Speaking of crazy colors, I spent pretty much ALL day yesterday bleaching some peek-a-boo tips onto my very dark bleach-resistant hair because I've been wanting to put some purple in my hair for a long time... I had been debating it because maybe I'm too old for that, but I think it would suit me.Well, the bleaching took FOREVER! Then I finally dyed the bleached ends blue fading to purple and the color is so dark you can hardly see the difference. Maybe it was a waste of time... But maybe it'll fade to something a little more noticeable. If it does, I'll post a picture or something. Anyhoo, I hope everyone is having a magnificent week so far! Happy Wednesday! Tiny Whittling Book Review - I made a wooden robin! Ever since I took a road trip down to Tijuana with my girlfriends in my crazy days, I have looooved Alebrijes, those tiny colorful Oaxacan wood carvings of an endless variety of animals. I have always wanted to make some. So check it out, an e-mail comes to my inbox about a new crafting book that I was so dang excited about. After clicking some linkage and doing maybe just a little bit of drooling over the author's Menagerie, I pretty much HAD to get my hands on a copy of Steve Tomashek's "Tiny Whittling", and IPG (Independent Publishers Group) was super kind enough to send me one. The book came, and after reading through the first few pages, I found out exactly what I needed to get started. I got some leather finger guards, a big block of basswood, and a carving knife from treelineusa.com. The book says you can get by with cheapy hobby or XACTO knife, but I really wanted to go for the gusto, so I sprung for the real deal, and I think it made a big difference. There were a few ultra-beginner projects in the book carving soap and carrots, but I skipped right to one of the beginning wood projects, "Songbird" being a little over-confident in retrospect. This wasn't like...super easy... but then again it wasn't too hard for me to pick up. I think the main thing is patience, because it took a little longer than I had expected. The instructions in the book were good. They were simple enough so I didn't get overwhelmed and confused, but gave all the necessary info. Basically, I went into the thing staring at a wood block, having no idea where to begin to shape this thing into a bird, and the instructions tell you in steps just what to do to make the shape you want. And there were tips on what direction you want the wood grain to go, which makes the carving much easier. Plus plenty of other little tips about stuff a beginner wouldn't have ever thought about. Here is my finished whittled birdy shape. It's a little rough, and doesn't look just like the book, but not bad, right? It took me about an hour and a half to go from woodblock to this. I made a giant mess of wood chips, and the basswood smelled a little bit like popcorn. One thing, the leather thumb guard was definitely needed. If you do this, get one of those. I like my thumbs and want to keep them, so I'm glad I got the guard. The book gives instructions on how to paint it like a goldfinch, but I went with my own little design and made a robin instead. Genius tip, it says to drill a hole in the bottom so you can put the figure on a toothpick for easy painting. Super smart! Worked like a charm. The little guy turned out super cute :) I glued on some plastic birdy feet I had in my stash and they were perfect. Bobby says that I should make little toothpick feet out of wood next time! Maybe I will! I am kind of hankering to make a little wooden toucan now. What screams cheeriness and get-well-soon like itty bitty monsters in lacy underwear? I took a scrap of watercolor paper I had, probably about 5x7'', and doodled some leaves on it. 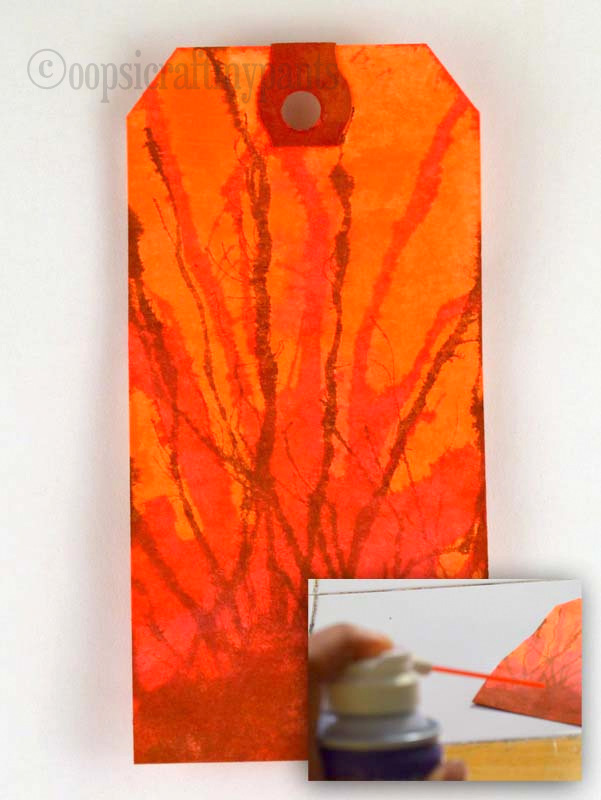 Then I used a variety of Tim Holtz Distress Stains to color the whole sheet right over top of the leaves. This whole process was super fast, it just took a while for the stains to dry. Then I just cut out all the leaf clusters and cut more little leaves out of the green scraps of stuff that was left over. The whole pop up thing is just cutting cubes upon cubes, then gluing the leaves and the critters to the boxes. And yes indeed, it does fold up flat still! Even with that whole forest on it. I hope everybody has a fantastic weekend. My plans are nothing... I can just relax now! And also on a proud-of-myself note: I gave myself a haircut yesterday (I used this YouTube video for instruction) and it turned out just super and saved money that I can now blow on more craft supplies. Good morning! It's the second day in 2013 and I am determined to spend it all in my jimmie-jams. I caught another cold from my visiting family and all the kiddos, but it's a total lack of surprise even after the ludicrous display of vitamin-munching I did. I'm just a sickness magnet. Boo. At least this time it was worth it and I know exactly who I caught it from. Well, now I'll be relaxing and crafting and blogging. Today's thingie is an inchies cube ornament. They're actually about 1.5" by 1.5" each, so technically they're inchies-and-a-halfies. But let's just says inchies, okay? Once I made all the inchies, I just glued em each to one side of a wooden cube that I painted black with craft acrylics. Here's another angle. I don't have a picture, but I finished the project by drilling a tiny hold and adding a tiny metal screw eye to attached a loop of string for hanging. If you wanted to use the little guy as a di (dice? die?di?) you could just unscrew the eye and there you have it. It's 12:01! Happy New Year! Scheduled Blog Post! I'm probably asleep! I have plans for 2013 that involve a lot more new fun and exciting crafts and skills to share. I want to share more videos and more tutorials and more book reviews! The last few months of 2012 have been nutso-crazytown-deluxe with business-sauce. I'm crossing my fingers for a little more free time this year so I can do a little more sharing and caring. I hope you all have had a great year, and I wish you the very best new year.